Gretchen Reynolds, blog writer for the New York Times, should have done more homework before she penned a report that referred to a published report in The Journal of Physiology that errantly claimed resveratrol (rez-vair-ah-trol) supplements undid the beneficial effects of physical exercise. That report had already been called into question in two subsequent issues of the same journal. Researchers at the University of Copenhagen claimed resveratrol reversed the positive effects of exercise upon blood pressure, cholesterol and blood sugar. But at no time did the blood pressure, cholesterol or blood sugar/insulin levels fall outside the optimal range. There was not even a significant statistical difference, only a numerical difference in these numbers. Furthermore, the most recent of these denunciations pointed to the fact the study’s authors buried in a chart of tables the fact that males given resveratrol significantly improved on a step test, a fact which went unmentioned in the text of the article on in news reports where its authors were interviewed. In fact, reviewers called the very objectively of the University of Copenhagen report into question. It appears their report was written with intent to unfairly malign this red wine molecule. Researchers getting caught red-handed as they maliciously disparage one of the most promisingly natural molecules ever discovered and getting it past peer reviewers at a major science journal suggest collusion on a grander scale. But Gretchen Reynolds wasn’t finished. Her report pointed to a study that concluded antioxidant supplements among athletes, namely vitamins C and E, are of worthless value. The antioxidant supplements failed to re-generate mitochondria, energy-producing compartments inside living cells. But this was already widely known. 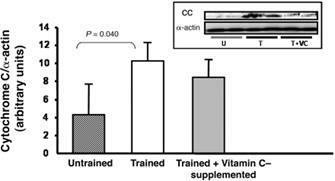 A report that is now over forty years old noted that supplemental vitamin C failed to improve athletic performance. So are these new studies, which add nothing to already known knowledge, just being drummed up in ongoing barrage of negative reports involving dietary supplements? Reporter Reynolds quotes an expert in the field of sports and nutrition to say: “Personally, I would avoid high dosages of antioxidants while training as you risk losing some of the benefits of exercise.” But that is not a balanced viewpoint. While antioxidant vitamin supplements may not improve performance and even may reverse some of the benefits of exercise, performance is not the end-all for athletes. For instance, vitamin C is necessary for rebuilding connective tissue damaged during exercise. Supplemental vitamins C and E have been found to reduce muscle damage among soccer players. Furthermore, supplemental vitamin E has been found to inhibit red blood cell destruction in connection with physical activity among female athletes with irregular menstrual function. Additionally individuals who participate in heavy physical exercise are known to be more susceptible to the common cold and respiratory infections. Three studies point to supplemental vitamin C as being of value in reducing the incidence of the common cold among athletes. Indeed, supplemental vitamin E was found in another study to cut the risk of pneumonia in half among male smokers who exercise. So it appears supplemental antioxidants may reduce performance and endurance among those who exercise, but there is a trade off in reduced muscle injuries and fewer respiratory infections. That trade off goes unmentioned by vitamin critics. During cursory examination of some of these studies critical of antioxidant supplements among athletes I found a report published in 2008 that came to the same conclusion that researchers recently reported – that antioxidant vitamins don’t improve regeneration of cell energy-producing mitochondria, an indication that endurance should improve with use. The authors of that study reported on the amount of a protein (cytochrome C), which is an indication of mitochondrial renewal, “did not result in any significant change in the concentration of this protein.” But you can clearly see in the following chart extracted directly from their report that supplemental vitamin C did in fact improve cytochrome C protein levels, just not as well as trained athletes who did not take vitamin C.
Again, another study notes that supplemental vitamins C and E help decrease lung injury among runners who exercise in adverse conditions (hot, humid, polluted air environment). And supplemental antioxidants may be of value to overweight exercisers. Indeed, sports nutrition experts note that intensified exercise training is associated with risk for infection and recommend antioxidant nutrients to avoid illnesses that can impair performance. ©2014 Bill Sardi, Knowledge of Health Inc.